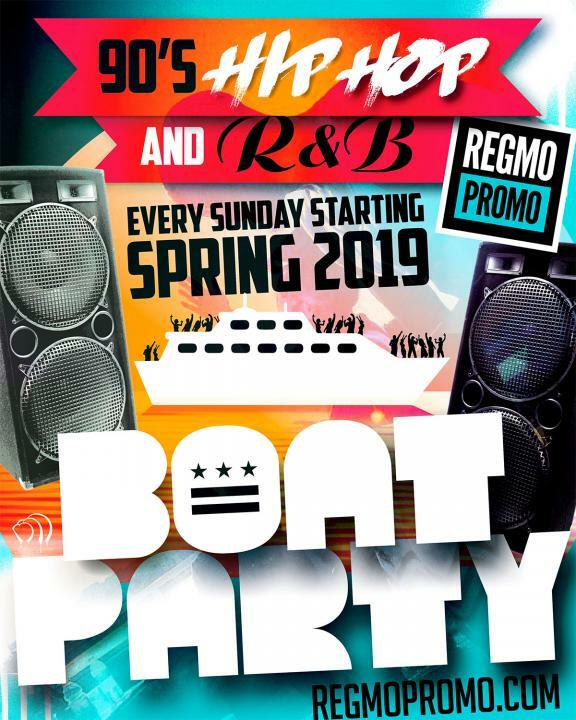 TICKETS ARE NOW AVAILABLE FOR THE MOTHER’S DAY EDITION OF THE 90’S HIP HOP R&B BOAT PARTY!!! We will be on the 2 Level Boomerang Yacht and TICKETS WILL MOVE FAST!! We will head out from the Georgetown Waterfront across the Potomac and back Sunday, May 12th, 2019 from 6:30PM – 9:00PM just in time to catch the beautiful sunset!! DJ MONEY and DJ CASPER will have you partying nonstop to your favorite classic Hip Hop and R&B favorites from the 90’s throughout the cruise. This year there WILL be food sold on the boat ride. Tickets can be refunded up to 6pm Sunday May 5th, 2019. You can check-in at 3100 K St. NW, on the deck in front of Nick’s Riverside Grill, on the Georgetown Waterfront at 5:30PM. We will have a RegMoPromo table setup. Boarding begins at 6:20pm. The boat departs at 6:30pm. We will return at 9pm. This is a 21 and over event. No exceptions.